Foot & Nail Health Care Services in the comfort of your own home! Book now to arrange your inclusive consultation & treatment service. We come to you! Serving, Flintshire, Denbighshire, Conwy & Surrounding Areas. Looking for a local Mobile Foot Health Practitioner? I am a qualified and experienced Mobile Foot Health Practitioner, offering a fully comprehensive home service that is guaranteed to be professional, friendly and condfidential, to clients in Flintshire, Denbighshire and Conwy, for an inclusive cost of £25.00, that also includes evening visits. The reserved title of Chiropodist or Podiatrist is applicable for those who have officially attended University. 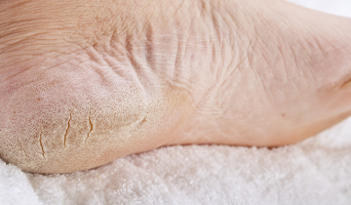 I am in the Private Sector, and therefore trained at the College of Foot Health Practitioners in the West Midlands (http://www.collegefhp.com/) a modern college that trains and qualifies its students to a high standard to treat a range of everyday foot conditions. A Foot Health Practitioner is fully qualified to undertake a variety of routine work necessary to maintain the health of the foot, which may include, but is not limited to, nail trimming and correction, skin conditions, heel pain, corns, callus, verrucae, blisters, athletes foot, management of ingrowing toenails (without invasive surgery), diabetic foot assessment and monitoring, treatment of fungal infections, including general advice and guidance on foot care and footwear. The symptoms described can be caused by a variety of conditions, including diabetes mellitus, arthritic hands, eye troubles, ankylosis of the spine, obesity, pregnancy etc. Many patients will simply have difficulty reaching their feet for maintenance - others appreciate the help of a practitioner who they can trust to trim and maintain their nails properly. Foot Health Practitioner's who are members of the Alliance of Private Sector Practioners, are committed to Continual Professional Development (CPD) and are listed on the Accredited Register of Foot Health Practitioners. Stimulates nerve function, boosts circulation, relieves pain and much more. Particularly beneficial for those with rheumatic/arthritis pain, poor mobility, chilblains and plantar fasciitis (heel pain). Improves your wellbeing from sole to soul! Please note, if your area is not listed below but within surrounding areas, please get in touch as I may be able to reach you. If you have any questions, would like some advice or would like to book an appointment, please submit your details here. Please enter your telephone number if you would like a call back. 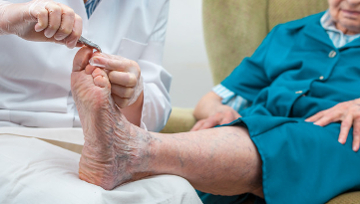 Mobile foot health care specialist treating a wide variety of Foot & Nail care problems and assistance with toe nail cutting for residents of Deeside, Flintshire, Denbighshire, Conwy and surrounding areas. Appointments are flexible, including evenings and weekends and always provided from the comfort of your own home.